This year sees the 75th anniversary of the start of the Second World War. Many excellent books are being published on various aspects of this terrible conflict and from time to time I’ll highlight some of these in BookPick, beginning with The Gathering Storm. The term ‘the phony war’ is often applied to the first months of the Second World War, suggesting inaction or passivity. That may have been the perception of the war on land, but at sea it was very different. 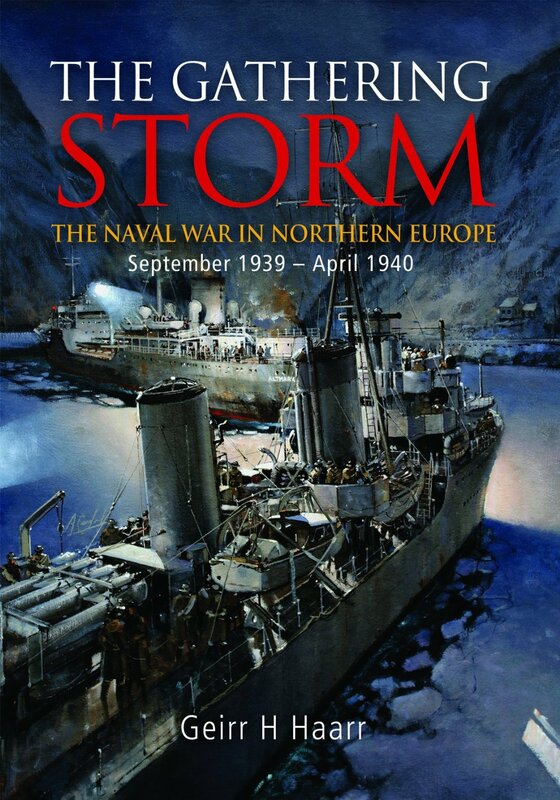 Geirr Haarr’s book is a compelling survey of the fierce naval struggles from 1939 up to the invasion of the Norway in April 1940. Haarr begins his book with the sinking of the German fleet at Scapa Flow in 1919 and then covers the rebuilding of the Kriegsmarine and parallel developments in the Royal Navy, and summarises relevant advances in European navies. The book then addresses the actions at sea starting with the fall of Poland and the sinking of Courageous, the German mining of the British East Coast, the Northern Patrol, the last fight of Rawalpindi, small ship operations in the North Sea and German Bight and the Altmark incident are all covered. German surface raiders and the early stages of the submarine war in the Atlantic are also touched on. As with his previous books, Geirr Haarr has researched extensively in German, British, and other archives, and this work paints a balanced and detailed picture of this significant period of the war when the opposing naval forces were adapting to a form of warfare quite different to that experienced in WWI. Published by Seaforth, and with excellent photographs and maps, this book has been hailed as the definitive work on the subject. I am lucky to live near the HMCS Haida, which was used during WWII. It never ceases to amaze me, how small this ship really was compared to modern cruise ships. On a tour of the ship, you can go up to the guns. During a tour taken by Charles and Camilla, the guns were fired. I can’t imagine how terrifying it must have been to be on board during a naval battle! Sir, I hope that the IBSN and date and place of publication are always included in future book recommendations.